SSC Women: #7 FSC Takes Down #21 Saint Leo 15-6 – Both Recaps! 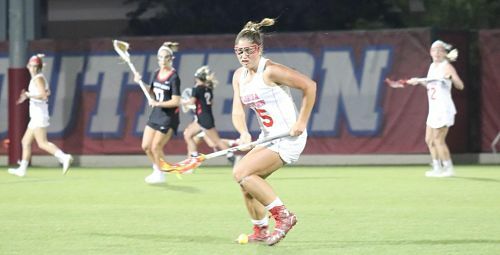 LAKELAND, FL – Florida Southern College women’s lacrosse spoiled Saint Leo’s bid for a perfect season as the Mocs (12-2, 4-1 SSC) held the Lions (13-1, 2-1 SSC) to a season-low six goals. Senior Dani Bursinger won a total nine draw controls for the visiting Mocs and with her sixth draw control of the game, she hit the 400 mark for her career. She is the first Moccasin to hit this milestone. A pair of Mocs recorded three goals as Aubriana Benedetto and Brenna Smith led the Florida Southern offense. Both Sarah Grady and Maliah Benedetto found the back of the net twice, while five more Mocs tallied a goal in the victory. • Smith opened the scoring early as she put her first of three goals past the Saint Leo goalie just 42 seconds into the game. After more than seven minutes of scoreless action A. Benedetto put the Mocs up 2-0. Sam Keesey won the ensuing draw control and 19 seconds later Smith gave the Mocs a 3-0 advantage. Saint Leo got one back as they put the first of four first-half goals past Patricia Werker at the 17:41 mark. Three minutes later the Mocs’ Julia Couch took a feed from Ashley Norberg to put the visitors back up by three. After a Grady goal, the Lions would use a 2-1 run over the next seven minutes to cut the Mocs lead back to three. The Mocs would answer with a 3-1 run of their own to end the first half with a 9-4 lead at the break. • Florida Southern held nothing back as they scored all six of the teams second half goals consecutively to take a 15-4 lead late in the game. Marina Jozokos tallied the tenth Moccasin goal less than three minutes into the second half. For the third time this season the Benedetto sisters teamed up for a goal as younger sister assisted on the older sister’s goal to put the Mocs up 11-4. M. Benedetto followed the assist up with her own goal off a feed from Bursinger. At the 16:40 mark, Norberg put the Mocs within one of turning on the running clock. Just over three minutes later, Grady put her second goal past the Lions goalie for a ten goal advantage in favor of the visiting Mocs. Smith put the final Florida Southern goal in the back of the net with 11 minutes remaining in the game. The Lions’ Leslie Ferguson put her 40th goal of the season past Werker to put the Mocs lead back to ten. With 90 seconds remaining, the Lions scored the games final goal for a 15-6 final. • Florida Southern extended their all-time record to 8-0 over Saint Leo. The Mocs have four wins in both Lakeland and Saint Leo. • Florida Southern won 18 of 22 draw controls. • Florida Southern picked up 15 ground balls to 30 by Saint Leo. The Mocs converted 18 successful clears on 22 attempts. • The Mocs fired off 27 shots, 22 of which were on goal. 11 of the Lions 20 shots were on goal. Florida Southern caused nine turnovers as Saint Leo turned the ball over 21 times. • Head Coach Kara Reber improved her coaching record at Florida Southern to 131-24 and holds a 199-72 mark in her career. • Bursinger recorded her 400th career draw control at the 1:38 mark of the first half and sits at 403 in her career. • The Mocs four-game road trip to end the regular season continues as they head to Ohio for their final non-conference games of the regular season. FSC will be at Tiffin (April 12) and Findlay (April 14) over the weekend. The regular season finale put the Mocs at Palm Beach Atlantic (April 20). SAINT LEO, Fla. – In a Sunshine State Conference matchup and a top-25 showdown at University Turf Stadium, No. 21 Saint Leo fell 15-6 to the visiting No. 7 Florida Southern Moccasins. Kaci Archer paced the Green and Gold with three goals where Leslie Ferguson, Delaney Chrisco and Lexie Walstadall chipped in with one apiece. After a slow start for both teams, Florida Southern held a 9-4 lead at the break before the Mocs mounted a 6-2 second half score differential for the 15-6 final. Kaci Archer netted three goals against the seventh-ranked Mocs, her fifth game earning a hat-trick or more. Erin Davis made seven stops in goal for the Lions in the full 60 minutes in the cage. Leslie Ferguson has scored in every game this season as the team’s leading scorer now with 47 goals and as the program’s all-time leading scorer with 131 goals. Kaylah Walstad heads into senior day with 49 career assists as the program’s all-time assist leader. Head Coach Caitlin Hansen led the Lions to a 13-0 run, the best season start in program history. Saint Leo continues play against top nationally-ranked opponents. On Saturday, April 13 at 11 a.m., the Lions are slated to host Sunshine State Conference No. 5 Rollins Tars. Before the draw, Saint Leo will celebrate their graduating class of eight: Rebecca Halley, Leslie Ferguson, Neely Regan, Sabrina Sanacore, Lexie Walstad, Kaylah Walstad, Anna Tamayo, and Haley Campbell. For the latest news, updates, and information on the Saint Leo women’s lacrosse, be sure to visit SaintLeoLions.com. Fans can also stay up-to-date on the latest Lions news by following Saint Leo Athletics on Facebook, Twitter, Instagram, and YouTube. PrevSSC Men: Saint Leo Over FSC 23-14 – Both Recaps! NextSSC Men: #16 Tampa Holds Off 2nd Half Rally by #20 Rollins to Win 13-12 – Both School Recaps!